My heart just STOPPED when Soarin' did that. I'm gonna cry some more. I already caught the error I made when spelling months. 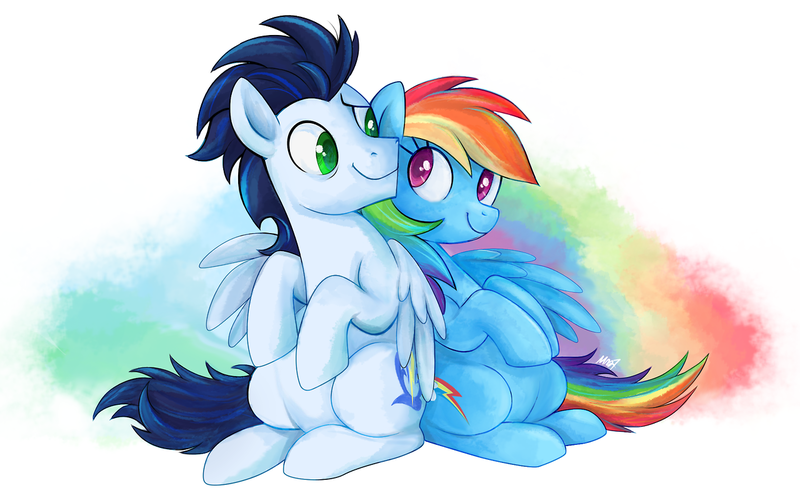 After years of waiting, Soarin finally gets the guts to propose to Rainbow Dash. But will he succeed with Braeburn and Pinkie trying to help? Well, hopefully it'll get somewhere. Yeah you heard that right! The sequel is out for you Soarindash shippers! Does the description look good? Should I change anything? So a sequel to this story is coming soon. SoarinDash comic in my notebook with the help of my artistic best friend in the real world, Mokie. He everyone I have made my very first collab! Come and check it out! A Rainbow-Filled Night Tell me what yall think it! This was a complete 50/50 project between myself and Mr Reader. Hope you all enjoy some SoarinDash! When people say "No Couple is Perfect." Hi everyone! Tranquil Stone here!! Whether you've read my story 'Everytime' or not, I need some help. Okay, so if you've read it, you'd know that part one of 'Everytime' is over! Yay!!! (But I am a little sad to say goodbye too ) Anyways, I'm not sure where I should write part 2...as in should I make a new story with 'Everytime' as the prequel or continue the story in Everytime? Thank you all for your time and I hope to see you in the comments again for 'Everytime''s second part! I wanted to write a story for today, but I couldn’t find a sufficient song. So therefore, I’m just going to wish everypony a happy Valentine’s Day. I'm super excited to continue on from Why Me?! I've been thinking about doing a sequel, but obviously I haven't gotten around to it until yesterday and I love the feedback! I know the first story was rushed at the end, (thanks to my great "I want to finish this even though it's 4 AM motivation) but this time I'm definitely going to try to spread it out. I'm looking at making about 10 chapters. If I feel like that it's not going to make it there, I'll at least add more words to each chapter. Just finished reading 'It's (Not) a Date' by Killbles. SO CUTE! FYI. Would totally recommend. Even if you don't like the ship, the story is beautifully written and captures the characters perfectly. I can't stop reading SoarinDash. Report Marshall_Evergreen · 89 views	· #Soarindash #phases #bane of life #save me! Working on the final touches now. Changed the original subject of it from being about Tank due to A) Tank being boring to write for at least to me, which has helped feed into how long this update took and B) because of one of the MLP comics giving me an idea concerning two of my three favorite ponies that can also lead in to the third one. You'll get it when you see it I think. I swear I have to write something on this now. Soarindash related, or not! Hmf!